Real estate calculators are one of the revolutionary innovations of the modern technology, particularly designed for real estate and mortgage professionals. Nowadays, no real estate analysis can be imagined without the use of a real estate calculator. It is an extremely useful tool for quick and accurate real estate calculations. Especially when there is no time for more complex software, like the Excel’s spreadsheets, for example. Having a real estate calculator your pocket during meetings and discussions with clients is the ideal solution for you, if you are a real estate analyst. There is a great number of real estate calculators in the market, but finding the right one that will meet your needs and requirements is what you are looking for. In order to help you in making your choice, here we are going to list some of the best real estate calculators. Qualifier Plus IIIFX – When it comes to complex mortgage problems, this is the right moment where Qualifier Plus IIIFX calls to action. It is particularly made for calculating the internal rate of return (IRR) and the multiple cash flows. Moreover, it is extremely useful in calculating the net present and net future values (NPV/NFV) too. Its utility is also seen in giving instant and payment solutions, such as PITI, P&I and Interest-Only Payments. Thanks to this model of real estate calculator, there are no complicated formulas. Hence, quick and accurate solutions for quick purchase and refinance decisions. Pocket Real Estate Master – Being only 85.1 gm heavy, the Pocket Real Estate Master can easily fit in a pocket. Apart from being easy-to-carry, Pocket Real Estate Master is also an easy-to-use real estate calculator. Its specialty is comparing loan options and providing the best and the fastest mortgage solutions. Furthermore, the Pocket Real Estate Master is useful in other important calculations too, such as amortization,interest, remaining balances and future values. This real estate calculator is a must-have for both financial professionals and future home buyers. Texas Instruments BA Real Estate Financial Calculator – Specialized for real estate analysis, this type of financial calculator is ideal for annual percentages rates and payment schedules. Its special real estate functions are quick calculations of mortgages, PITI, be-weekly payments and ARMs. 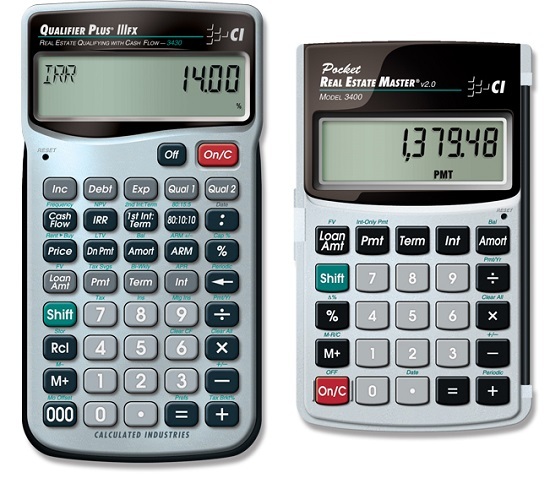 In other words,words, there isn’t a person in the real estate industry that does not own this versatile Texas Instruments BA Real Estate Financial Calculator. Hp 17bii Financial Calculator – This is one ultramodern calculator with five special menus: Business Percentages Menu, Financial Menu, Time Manager Menu, Statistics Menu and Equation Solver Menu. Thanks to them, it provides around 300 statistical and business functions. Another really awesome feature of the Hp 17bii Financial Calculator is that each time you press the wrong button or are missing an appointment, there is a beeper that sounds and notifies you. It is definitely worth having! This entry was posted in Calculators, Office and tagged Calculator, Real Estate, Real Estate Calculator by australiaonline. Bookmark the permalink. I totally agree with your statement.